But Ian Bremmer is more than just a talking head. While some former diplomats or retired professors turn to consulting a là Henry Kissinger late in their careers, Bremmer actually began his by founding Eurasia Group, an enterprise he has since built into the most successful political risk-consulting firm in the world. 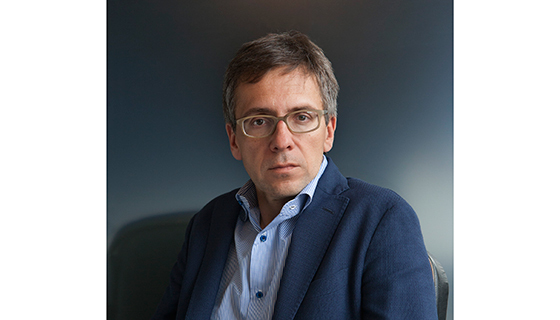 Ian Bremmer is only one-fourth Armenian (on his mother’s side), but he has always treasured that part of his heritage and the Armenian community’s embrace of his abilities and ambition. Ian’s mother eloped with his father and moved to Ecuador when she was just 19 years old. She became an officer’s wife, and after 22 years in the service they moved back to the United States, where Ian was born. Armenians are known for their strong, traditional sense of family, and Ian’s grandparents were no exception. “I spent quite a bit of time with my grandparents. My grandmother, in particular, was quite a pistol,” Ian remembers. The father of Ian’s maternal grandmother Maria was Simon Orfaly (originally Simon Ourfalian), a merchant from Aleppo. Simon’s parents were Nikolas Orfaly and Anna Poladian. According to Ian’s uncle Louis, Nikolas’s family name was originally Gimishgerdanian, and his family hailed from Ourfa. Simon married Tourfanda Kassabian in Adana, Turkey. They had three sons and one daughter, as well as two other children who died shortly after birth. Maria and her brother Loutfik were born in Aleppo; their brothers Antranik and Nubar were born in Adana. Simon, Tourfanda and their children left Piraeus, Greece on the S.S. King Alexander and arrived on Ellis Island on July 2, 1923. Ian’s grandmother Maria was “incredibly tough,” a fiercely intelligent woman with an outsized personality who didn't want help from anybody. Ian inherited his love of politics from her: “She was very politically involved: she started a ‘silver haired legislature’ in Massachusetts for senior citizens in order to promote legislation that would support them. She would bring me to the State House for meetings and events, including ceremonies every Veterans Day. [November 11] also coincidentally happened to be her birthday—mine was the 12th — which seemed to amuse everybody. When I was in second grade, she got me a meeting with the Lieutenant Governor Tom O'Neill, Tip O’Neill’s son, which I wrote up as an interview in the Chelsea Record, our daily paper,” Ian remembers. Bremmer is grateful for how tightly knit Armenian communities are – a holdover from the Armenian people’s persecution by the Turks. The support of the Armenian General Benevolent Union (AGBU) in the form of scholarships and counseling was crucial for a boy from a humble background to attend elite universities: “When I was younger, Armenians took a great interest in me. Through the AGBU I was awarded a George Holopigian and Hrair Hovnanian Memorial Fellowship for college. Louise Simone, in particular, took a strong and personal interest in what I did. She was always looking to stay in touch and to engage me with their programs. Also at the AGBU, Anita Anserian and Carol Aslanian became personal and family friends,” Ian says. Bremmer took his first trip to the Soviet Union in 1986 with a small student group led by Tulane Professor Ray Taras. The group travelled to Leningrad, Moscow, Tbilisi, Baku and Yerevan. “While the newspapers at the time all wrote about the ‘Soviet monolith,’ the so-called ‘evil empire,’ it was clear that the peoples of these republics were radically different. It didn't feel like one country, and it certainly didn't feel like one nation. Going to Armenia was particularly impactful because I recognized pieces of the culture — the food in particular, but also the people. I remember seeing a man on the street who was the spitting image of my great uncle Nubar. That still sits with me,” Ian explains. Bremmer returned to the United States and finished his Ph.D. at Stanford in 1994. By 1998 he had founded Eurasia Group, originally focused on analyzing the politics of former Soviet and East European countries. Today, the firm’s research platform is global— Eurasia Group’s leading analysts monitor political, economic and social developments across the globe and assess risk for businesses and investors. They also produce research on cross-border issues such as trade, energy and other commodities, as well as finance regulation, climate change and global health. Eurasia Group also publishes an annual “Top 10 Global Risks” report that receives coverage in media outlets around the world. The Armenian side of Bremmer’s family was driven from its hometown during the Armenian Genocide, finally finding refuge in America. Not surprisingly, Bremmer is a strong believer in immigration: “Armenians are a wonderful example of how people persecuted halfway across the globe were welcomed into this great country and allowed to make it an even better place. The community flourishes today, to a far greater degree than has ever been possible in Armenia itself. That's an extraordinary thing,” he says.